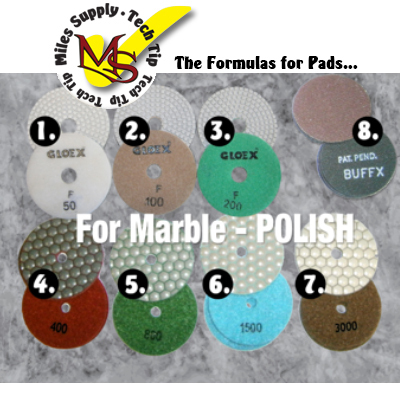 These pad progressions/formulas or Line-Ups mix wet & dry diamond pads depending on the type of stone and desired finish. Trick = Running the dry pads with water! Line-Up charts for Abressa Edge polishing. This step-by-step Tech Tip video shows exactly how to do it, and it features the newer SandHandler with the screen on the front of the cabinet. Pattern complete button repeat for each stone go to AUTO-RUN page, press Start button. How Do I Get Longer Life Out of My Diamond Wire? Why are my liners wearing irregularly? Regularly check the alignment on Pellegrini’s single-wire flywheels. This tip offers longer wear & life on diamond wire, flywheels, guide wheels and liners. On the Tension side of the machine, the side closest to center should be tipped away from the column max 3mm / max 6mm on the Drive side. Clean dust and dirt from break. Squeeze epoxy onto break. (Barre-Pak™ epoxy works great.) Set broken piece into place. Use wedges front and back against 2×4’s that have been driven into the ground to hold the piece in place. Squeeze epoxy onto break and set other broken pieces in place. Again, use wedges to hold pieces into place. Allow a minimum of 24 hours for the epoxy to set up. A longer time is necessary in cooler weather. Barre-Pak™ is easy and simple to use, anyone can use it! Follow the simple instructions and the guesswork has been eliminated because Barre-Pak™ is pre-measured in a 70-gram kit. Barre-Pak™ is mixed in its own container (without opening the package) and then squeeze out to apply. Clean and neat! Simply spray or pour Clean Stone cleaner on the dirty stone. Rinse with water. It’s that easy! Some scrubbing or repeated steps may be necessary for extra dirty stones. Clean Stone was specially formulated to be an environmentally safe product. Silicon Carbide or Diamond Brushes (diamond impregnated into the filament) coated with resin have more structural strength, providing a longer life and producing a more consistent finish. See brushes. Of course, the brushes we sell have the resin coating – give us a call!